Diamond Jim’s has been a favorite gaming entertainment destination for nearly 20 years or more. Our two Missoula casino locations are the best in Western Montana. Diamond Jim’s Eastgate features a friendly casino, a fully-stocked liquor store and comfortable lounge. Diamond Jim’s Russell is conveniently located in the heart of Missoula in the same complex as a Noon’s convenience store; serving both your entertainment and day-to-day needs. Our Missoula casinos feature i-Rewards players clubs that reward our loyal customers for playing keno, poker and line games at each of our locations. 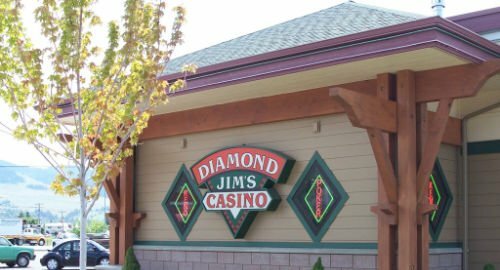 With the best service and relaxing atmosphere, we invite you to join us and get your luck started at Diamond Jim’s! follow us on Facebook for special events. *All images are for graphic representation only, actual bottles may vary. Prices good only for the business days listed. Any discrepancy or typographical errors are overruled by in-store pricing per state law. Must be 21. ID Required. Cash for play! At Diamond Jim’s Casino, the more you play, the more we pay. Join our Players Rewards Club and earn rewards on all your plays on any machine and enjoy free complimentary beverages and snacks. Receive 400 bonus points just for signing up and receive 500 point on your birthday each year. View each location’s events calendar for double and triple reward opportunities. Stop in today and sign up for Montana’s Premiere Player Rewards. Let your luck start here. We are always accepting applictions. © 2019 Diamond Jim's Casino. All rights are reserved.